In 10-inch skillet, cook sausage over medium-high heat 6 to 8 minutes, stirring to break up large pieces, until no longer pink. Drain, and reserve. In large bowl, beat eggs, milk, salt and taco seasoning mix with whisk. In slow cooker, mix potatoes, sausage, chiles, 1 1/4 cups cheese and the egg mixture; stir to combine. Cover; cook on Low heat setting 2 hours; carefully remove slow cooker's ceramic insert, and rotate insert 180 degrees. Cook 2 to 2 1/2 hours longer or until temperature reaches 160°F in center and egg mixture is set. Let stand uncovered 10 minutes. Meanwhile, heat boats as directed on package. Spoon egg mixture into warm boats; top with Toppings. Want more fresh toppings? Try chopped fresh cilantro, sliced green onions or sliced jalapeños. 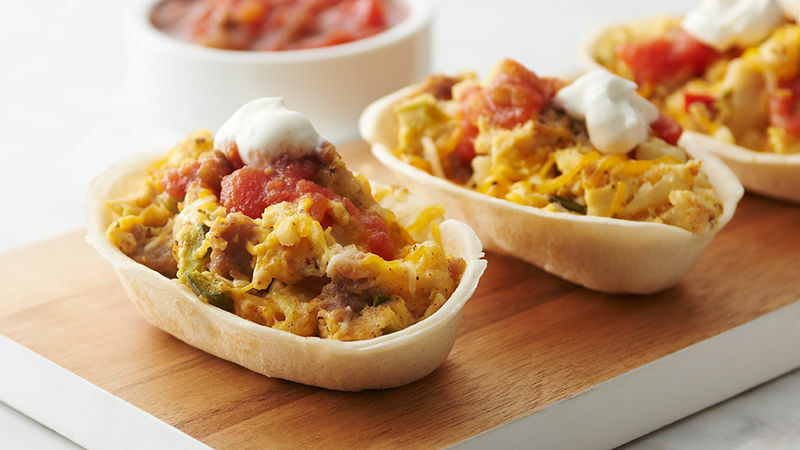 You can use Old El Paso™ traditional 8-inch burrito wraps instead of mini tortilla boats. The recipe will make about 8 large breakfast burritos. Rotating the ceramic insert halfway through cooking will result in evenly cooked eggs.